提交App审核时若未勾上“使用了IDFA”被拒的提示如下： Improper Advertising Identifier [IDFA] Usage. Your app contains theAdvertising Identifier [IDFA] API but you have not indicated its usage on thePrepare for Upload page in iTunes Connect. 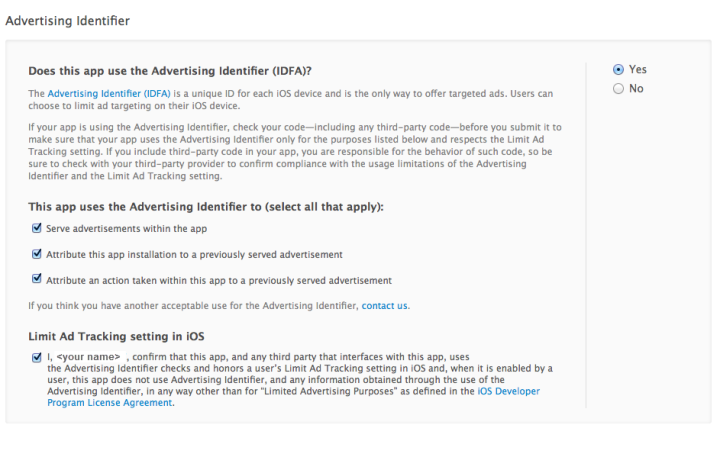 提交App审核是若未勾上“Limit Ad Tracking setting in iOS”被拒的提示如下： Improper Advertising Identifier [IDFA] Usage. Your app contains theAdvertising Identifier [IDFA] API but your app is not respecting the Limit AdTracking setting in iOS.